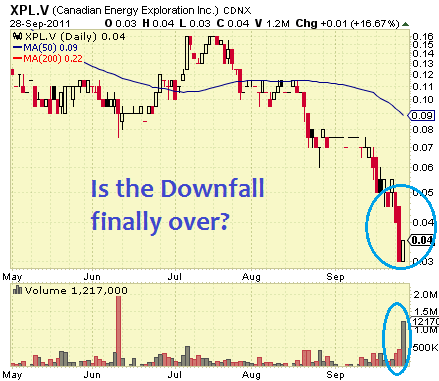 Is This the End of the Fall for Canadian Energy Exploration Inc. (CVE:XPL), (PINK:CXXXF)? Judging by the graphics, this stock is heading straight towards ... the zero mark. Its downfall has been going on for three months now. Not a very happy performance. It was the last session that gave some hope for a possible rebound. Indeed, this Wednesday the shares of Canadian Energy Exploration Inc. (CVE:XPL), (PINK:CXXXF) made a move up on the TSX Venture Exchange. It happened at the right moment - a day after XPL had fallen to its all-time low of $0.03. What is probably of greater importance, the 16.7% advance in the price was supported by a very huge for the company trading activity. Basically, a price that is increasing on rising volumes is a bullish sign. However, it is very early and too risky to look at this one-day progress as the start of a probable come-back of the stock. Surely, company's directors are more than impatient such a revival to begin the soonest possible. In July, XPL was worth $0.16, or four times its current value of $0.04. The recent management changes and developments around Canadian Energy did not impress investors. The shares' decline was not disturbed by the recently held Annual meeting of stockholders either. Perhaps, in the fundamentals of Canadian Energy we can find some of the reasons for the negative performance of XPL. As the corporation admits, average gas and oil productions have slumped significantly during the second quarter of 2011, compared to the relevant period in 2010. Accordingly, sales revenue also tumbled down - a decline of over 51% from Q2 of 2010. On the other hand, in the end of this June, Canadian Energy had almost $6M in cash and about $5M in working capital. The company has no immediate financial problems or deficiencies. This could serve as a base to expect a bit brighter future for the corporation.